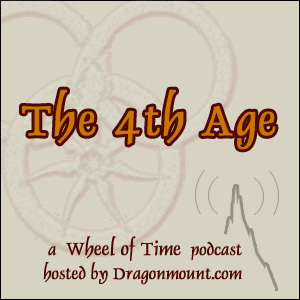 The 4th Age at JordanCon! Due to some uploading issues, you can temporarily download this episode here: Episode 113 - A Memory of Light This episode WILL NOT be showing up in iTunes YET. However, this post will be removed once it is. For myself, I think traditional weapons would be best. As the question made no mention of any training, I have to assume a situation where I'm taken as I am now, about to be thrust into a battle, and given the choice of weapons or the One Power. Now, I have no idea how to use the One Power. And, as we've read time and again, accessing the True Source is dangerous, at best. And even after that's mastered, it takes time to learn how to be dangerous with the One Power. With traditional weapons - swords, staves, and perhaps some projectile weapons - I at least know enough to not hurt myself, and would like to think that I would have a sporting chance against many possible opponents. Just had an existential moment: a blue Jeep wrangler with a hard top and a winch just drove past. It it'd had Idaho plates, I would've had a heart attack.